Impress bae and unleash your spirit of adventure of your next vacation with Temple Adventures' private scuba diving session in Pondicherry. If romance is all about the experiences, then boy does Temple Adventure know how to take it to a whole new level. That too below sea level, with their uber romantic private scuba diving session for couples. It's an all-day affair curated for maximum fun and romance starting with the on-ground training and basics of scuba diving. These guys have around 20+ dive sites both natural and artificial, so you could be diving amongst corals or an artificial reef with palm leaves, scooters, and various other metal structures. Post dive, celebrate with cake, champagne and strawberries and enjoy a romantic sunset cruise before heading back to the shore. Apart from this, since they are a five star PADI Certified they offer certification courses including scuba diving, open water diving, and speciality diving courses. 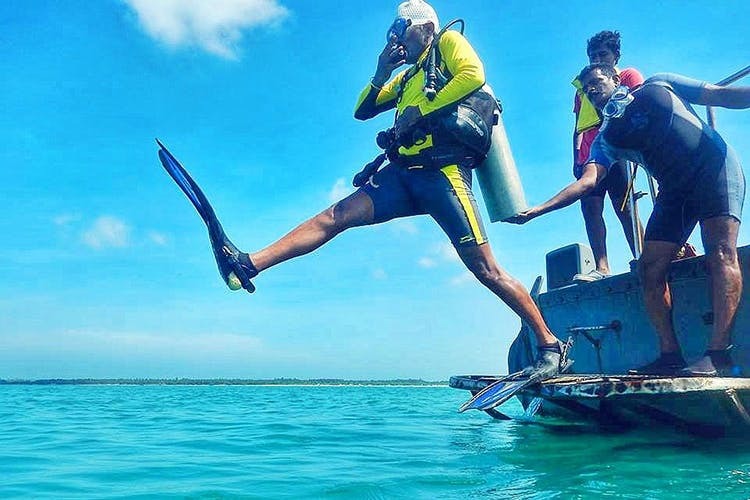 They all have courses for certified divers as well and these include fun diving sessions and outbound trips to places like Netrani and Rameshwaram. Romance comes at a cost that some might freak out about. But hey, the INR 26,000 that you need to shell out is all inclusive including private boat ride and underwater photography! If you are just looking to scuba dive in the ocean, do check out their Ocean Try Dive session.